John Maxwell, managing director at Inverallan Landscapes, has reported a number of benefits from using the Etesia Hydro 80 MKHP ride-on mower. Established in 1998, Inverallan Landscapes is a family run business based in Stirling. Over the past 21 years the company has specialised in grounds maintenance contracting and has a large client base which includes sites such as business parks, office developments, tourist attractions, churches, nursing homes, hotels, car dealerships and residential developments. Furthermore, its sister company Inverallan Garden Services, solely focusses on domestic gardens within a 30 mile radius. The company also boasts ISO 14001-2015 Environmental Management and ISO 9001-2015 Quality Management Systems certifications. 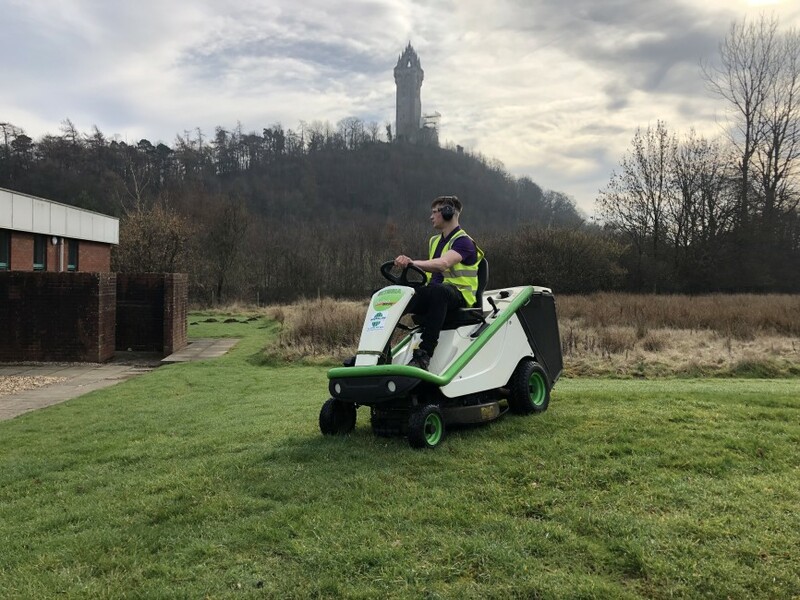 Inverallan Landscapes has seen incredible growth over recent years and now has an impressive fleet of machinery which offers a solution for every grounds maintenance requirement. John is quite particular when it comes to selecting machinery, insisting on using only equipment of the highest standard. Therefore, when he needed a new ride-on mower he was careful to ensure that it ticked all of the necessary boxes. "I wanted a ride-on mower that was compact, light and offered excellent performance," he said. "We have limited space in our work vans so the machine needed to fit into the back of them, which proved to be a difficult search. We also had to consider that there are some considerably tight and awkward green spaces which we need to attend to." Measuring less than 1 metre wide, the Etesia Hydro 80 is easily transported in any vehicle whether it be a van or a trailer. Its compact size means that this impressive machine can pass through most gateways and its tight turning circle makes it ideal for small or awkward areas. It mows close to walls and fences and is highly manoeuvrable. Also, with its large-sized front wheels, the Etesia Hydro 80 easily overcomes all obstacles such as pavement kerbs. It has been designed to cut and collect both long and short grass, without clogging. Add to that its compact dimensions, ease of use, hydrostatic drive and powerful 15hp twin-cylinder Kawasaki engine, and you have a highly efficient machine offering the kind of output that would easily replace three walk-behind mowers. The Hydro 80 has been robustly built and requires minimal maintenance. Operators have access to the engine and all working parts and the hydrostatic transmission system is maintenance free. The specially coated 60 mm tubular chassis is also designed for strength and long-life. "We have had the Etesia Hydro 80 for three seasons now and it is used mostly every day between four different vans. It is nice and light as opposed to some of our other larger equipment too. Up here the ground can be very wet and soft at times so the Hydro 80 is the ideal machine to get on and get these areas cut. We have the flexibility to mulch or pick-up the grass which is beneficial too. "It is also brilliant when attending to large grass areas because as opposed to having two or three operators using push mowers, we can just have one person covering the whole area with the Hydro 80. "Overall the Etesia Hydro 80 has been a great machine for us." For further information, please visit www.etesia.co.uk.